Suzanne Lindley moves to the front of the crowded meeting room to introduce the next speaker for her audience, a combination of patients, caregivers and medical professionals dealing with metastatic cancer in the liver. As she addresses the crowd, it’s hard to believe that this diminutive, soft-spoken woman is the same person who ran to the bathroom crying the first time she was asked to share her personal story at an advocacy training in Washington, D.C., in 2006. Since then, she has traveled extensively and spoken at meetings of physicians, patients, lawmakers and others who can impact research, treatment and hope for those with liver metastases. Suzanne was 31 years old when an oncologist told her and her husband, Ronnie, that she only had six months to live. Suzanne’s diagnosis: stage 4 colon cancer that had metastasized to her liver, seen as a certain and speedy death. So, they circled the date on the calendar, gathered up their two daughters, ages 8 and 11, and moved to the country an hour from their home in Fort Worth, Texas. The couple hoped to have at least a few months of the life she had always wanted. They bought a rambling farm house, horses, dogs and all the other parts of country life. Ronnie commuted to his job as an electrical engineer with a major aerospace company. That was in 1998. Trying to find anything that would help her cope with what she saw as the few months she had left, Suzanne went online and found a message board where, amid all the sympathy messages she received, one man challenged her not to give up, but to start treatment with chemotherapy. She did, and for the next six years, she focused on keeping the cancer at bay, raising her two daughters and taking an active part in country life. Suzanne moved from drug to drug and clinical trial to clinical trial, continuing to communicate and share information online and by phone with others who were also living with liver metastases. Most were patients with colon cancer. Colorectal cancer is the second leading cause of cancer-related deaths in the United States in men, and the third in women. In 2017, it is estimated that 50,260 deaths will be from colorectal cancer. At the time of diagnosis, 20 to 30 percent of patients have metastasis to the liver, a number that increases to 60 percent during the course of the disease. Suzanne also represents one of a new class of patients whose cancer is chronic, defined by the American Cancer Society as cancer that is controlled but not cured. This growing patient population has the option to move from drug to drug and, take “chemobreaks” while their cancer is stable, only resuming treatment when the cancer starts to grow again. Suzanne has coined the term “No Evidence of Active Tumor” (NEAT), expanding on the commonly used No Evidence of Disease (NED). Her goal, she says, is to both educate patients about their options and to change the idea that once the liver is involved, death is imminent. All Suzanne ever wanted was to be a mother. The daughter of middle class parents, she married Ronnie when she was 18 years old, a year after meeting on a blind date. By their fourth anniversary, they were parents to daughters Katie and Karlie. Suzanne says she “blew up” Ronnie’s world. He was an engineer who wanted everything in its place, and she was the one who thought nothing of loading up the girls and going camping on a moment’s notice. 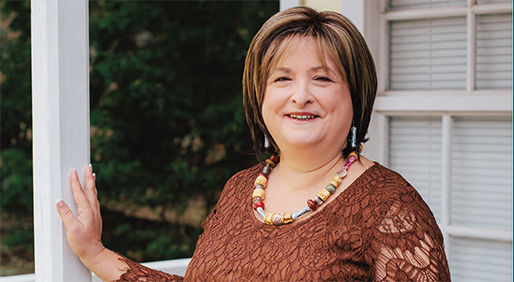 While trying to get pregnant for the third time, Suzanne learned she had colon cancer. Her father had polyps, but Suzanne says the genetic connection had not yet been established. Choosing to stay on treatment would allow her, she hoped, quality time with her daughters while preparing to die. In 2004, during yet another clinical trial, Suzanne learned that not only was the trial not working, but new tumors had appeared in her spine and multiplied in her liver. She went to a colon cancer meeting and showed her scans to a specialist. He said there was nothing to do but go home and get ready to die. Instead, Suzanne went to her network, looking for options, and someone recommended radioembolization, which places millions of “microspheres” of radiation directly into the liver tumors to kill them from the inside out. The use of “microspheres” was approved by the Food and Drug Administration in 2002, but was still relatively unknown at the time. Suzanne found a doctor doing radioembolization in Houston, an epicenter for cancer treatment in Texas and four hours from her home. The radioembolization destroyed 65 percent of her tumors. “I call them my little magic beads,” she says. With the remarkable response she had to the microspheres, Suzanne was able to begin chemotherapy again with a new drug that kept her cancer stable for 18 months. It was her first stable period since starting treatment, and she focused on raising her daughters and trying to keep hope alive. Suzanne’s own lifeline had been a social worker at Cancer- Care, a nonprofit organization in New York City that provides support to patients with cancer. “He said I needed to prepare for the next part of my life. I had been focusing on living until my daughters graduated, and I felt like I had reached that goal. Katie was 19 and Karlie was 15. I needed new goals,” she says. Just a few months later, Suzanne returned to Washington at the request of Sirtex, the maker of the microspheres that so dramatically reduced her liver tumors. She spent the day making calls with Andrew Kennedy, M.D., one of the leading researchers in the field and, at the time, co-medical director for Wake Radiology Oncology Services in Cary, North Carolina. “Reimbursement for brachytherapy, which microspheres falls under, was going to be discontinued by Medicare, and Dr. Kennedy asked me to talk to lawmakers about what it had done for me,” she says. After spending the day together in 12 meetings, Suzanne says she saw for the first time the dedication and commitment of a physician, the human being. They forged a bond that continues to this day. The two teamed up to create seminars on liver metastases around the country. Still a mutual admiration society, Kennedy, now physician- in-chief of Radiation Oncology at Sarah Cannon Research Institute in Nashville, credits Suzanne with helping to bring attention to microspheres. “He became my dream maker. I would go to conferences and hear speakers that had me dead before I walked out of the room,” she says. “I wanted a different kind of meeting where patients could talk to the doctors. Dr. Kennedy helped me put together that kind of meeting.” In fall of 2006, Suzanne attended the first LIVESTRONG Summit in Austin, Texas. Each attendee was asked to create their own action plan, which for Suzanne was the creation of a survivor line so patients could talk to someone about their needs, both medical and emotional. In addition, she founded her nonprofit organization, YES, which can be found at www.beatlivertumors.org. It provides help with insurance appeals and finding new research for patients. The website also offers the latest in treatment options and patient stories. The Hope in The Sand project, comprising photos sent by patients and caregivers from around the world, shows each person that he or she is not alone. On the website, the word “hope” can be seen etched in sand from war zones, beaches and the pitcher’s mound at Globe Life Park in Arlington, Texas, home of the Texas Rangers. Suzanne has a small group of trained volunteers who help, and offer expertise and support with the survivor line and other specialties. She says she also continues to take the calls that come in the middle of the night because that’s the time when emotions are high. She sleeps little these days because there is so much to do. Currently, she is planning the next symposium with Kennedy, using the model they created where patients meet the researchers and physicians as people. “There are no name tags. I want patients and doctors to be able to sit and talk about what they need and want,” says Suzanne. Kennedy says it’s a unique approach and one that he endorses. The recent retreat that Suzanne held in her hometown of Canton, Texas, provided inspiration and education. “She had surgeons, radiation oncologists, counselors, all kinds of specialists,” says Kennedy. “We spoke about not only what we have to offer, but also how it could work with other specialties to help patients who want to avoid certain side effects. Doctors don’t always listen to patients about this.